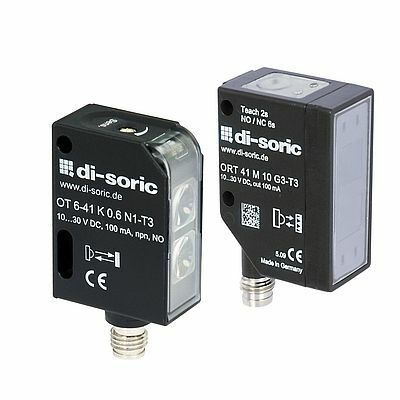 Developed based on different functional principles for diverse tasks in automation technology, di-soric’s 40 series optoelectronic sensors are small, robust and powerful. Light scanners, retro-reflective light barriers and background suppressors in red or laser light give the user plenty of room in finding the optimal solution for every application. The compact casing design features a pivoting connector plug and various mounting options for installation in narrow areas by means of mounting brackets or sensor mounts. Adjustment is achieved by a simple teach-in process. The switching state, which can be light or dark switching, and the functional reserve, depending on the model, are indicated by highly visible LEDs. Versions with a plastic casing and conventional potentiometer setting in the functional principles light scanner and retro-reflective light barrier round out the product line. Take advantage of the wide range of top quality products, our expertise and the service.